January 23, 2017 Patrick Nemechek, D.O. The use of probiotics is becoming extremely commonplace with a growing number of products being supplemented with a growing number of bacteria that are touted as health promoting. It is apparent consumers do not fully understand what they are, or what they can do, because the same people who use anti-bacterial wipes or gels will purchase a probiotic which is full of bacteria and swallow it without question. A probiotic is a supplement that contains bacteria that are capable of secreting mild acids once they reach the intestinal tract. Consumers are unaware that they also interact with the immune, nervous, hormonal and intestinal systems in potentially harmful ways. Probiotics are often sold as a “healthy” blend of “natural bacteria” that will restore or replenish your intestinal flora. These products are vastly overstating anyone’s understanding of intestinal bacteria. With modern technologies, we can sequence the DNA of the thousands of different bacteria that live within the intestinal tract. But most require such unusual factors for survival that scientists are unable to grow approximately 80% of the bacteria detected. Without being able to grow them, researchers can only guess at basic aspects of their function and behavior. If the researchers are guessing, then the sellers cannot fully understand what they are selling, and have no scientific basis to offer assurances of safety as they do. But despite this lack of understanding, many people have discovered that probiotics relieved some of their digestive issues. This is a very important clue because it means they have an overgrowth of (lower) colonic bacteria within the (upper) small intestinal tract. This bacterial overgrowth is called SIBO, Small Intestine Bacterial Overgrowth. This occurs when colonic bacteria migrate too high into the wrong section of the intestines. This may occur after taking antibiotics or antacids or when something alters the speed of the digestive tract such as anesthesia, vaccines, or brain injury resulting in Autonomic Nervous System Dysfunction (Dysautonomia). SIBO affects a large portion of the population and as many as 20% of people with SIBO report no intestinal symptoms. 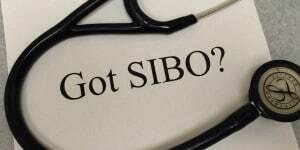 Others with SIBO experience intestinal distress (diarrhea, constipation, eat-and-must-go to the bathroom ASAP, excessive bloating), food sensitivities/intolerance, night sweats, morning nausea, sour stomach or “low blood sugar” between meals, skin problems (rashes, hives, eczema), and recurrent strep and bladder infections. Our intestinal tract is around 40 feet long. It works like a conveyor belt, moving food and waste products forward that our brain controls through our Autonomic Nervous System (“Autonomics”). The Autonomics are the brain’s master control mechanism for the organs, hormones, and immune system. The Parasympathetic branch of the Autonomics control our “rest and digest” brain commands and inflammation. SIBO may start after we experience an injury to our Autonomic Nervous System which alters the movement of our intestinal tract. The Autonomic injury may be a direct physical injury (concussion, car wreck), an indirect injury (emotional trauma), a metabolic injury (pregnancy, drug reaction, chemo/radiation), or an inflammatory injury (excessive vaccine reaction, antibiotics, anesthesia, surgery, reaction to allergy testing). Our bacteria have learned the first rule in real estate; location is everything. The colonic bacteria move up to a much better neighborhood (small intestine) where nutrients help them replicate and survive. The invading bacteria digest the nutrients and then release gases, toxins, and waste products that give us symptoms. The bacteria are smart and they will work to stay in their new location. They have learned to send signals to the brain via the Autonomic Nervous System’s main nerve, the Vagus Nerve. These bacterial signals further alter our Autonomics and slows down our digestion even more. Bacteria from the colon do not like an acidic environment and supplementing with probiotics creates an increase in acids in the small intestine. More acid production, means less colonic bacteria overgrowth, and the person may feel less symptoms. The relief in symptoms from increased acid is also probably why apple cider vinegar makes some people feel better. But probiotics do not fix the underlying neurological Autonomic problem, and people may lose the benefits once the bacteria can replicate and continue their migration upward. Probiotics may also cause health problems in other ways. I have seen children and adult patients become more nauseated, depressed, anxious, and even develop arthritic symptoms when they started supplementing with probiotics. And a word of caution, just because you do not feel an obvious ill effect does not mean the probiotic is not adding to your systemic inflammation level that triggers a wide variety of illness. So instead of adding living bacteria to the intestinal tract, I recommend a prebiotic fiber called inulin. Inulin is a fiber that can only be eaten by the healthy bacteria that normally inhabit the small intestine, not the invading bacteria from the colon. As the normal small intestine inhabitants grow in numbers, they excrete mild acids that the colon bacteria do not like and recede. It gently rebalances the intestine’s natural bacteria without the influence the unknown bacteria found in probiotics. Some have SIBO to the extent that inulin is not enough to control the colonic bacteria and they need a short course of antibiotics to knock down the bacterial overgrowth plus Autonomic Nervous System treatment for their brains to regain neurological control over the movement of their digestive tract. There are five stages in Autonomic Dysfunction and the first two stages do not have noticeable symptoms. It is only in the third stage of Autonomic Dysfunction that people start to experience symptoms that affect their daily life GI trouble. Autonomic Dysfunction does not appear on an MRI, CT scans, and it is not detected in yearly bloodwork. For over 10 years I have tested the Autonomics using spectral analysis to pinpoint the tone and balance of each of the Autonomic Nervous System’s two main branches. I also use Heart Rate Variability (HRV) testing as a marker for Autonomic function and recovery. I have found to maintain healthier bacteria one must also restore neurological (Autonomic) control over the intestinal tract. We must repair and maintain both the intestinal tract as well as repair and maintain Autonomic function. SIBO and Autonomic treatment often involves short-term medications to restore a better bacterial blend, core nutritional changes to support neurological repair and stem cell production, Vagal Nerve Stimulation, and long-term dietary changes. I have discovered a multifaceted formula for Autonomic restoration that is so unique and effective that in 2016 I filed a patent application for “The Nemechek Protocol for Autonomic Recovery” (Patent Pending). Controlling SIBO and maintaining Autonomic Nervous System balance is not easy, but it is also not impossible. The process takes work and a marathoner’s mindset; each day your efforts, foods, and medications either support or endanger your recovery and health. Fixing the brain, to fix the body, takes persistent effort by the patient but I have seen recovery years or decades after the person’s Autonomic injury or onset of SIBO. For more information, call my office at 623-208-4226. © 2016. Dr. Patrick M. Nemechek and Jean R. Nemechek. All Rights Reserved. Patent Pending. Its often hard to link this change in behavior with this change in regimen especially when gut bacteria are involved. There is a chance that the probiotics increased his propionic acid levels and you’re experiencing an awakening by stopping them.